Mercurii, 6 die Novembris, 1678. Papers relating to the Plot. Coleman to be again examined. Papers supposed to relate to the Plot. A PETITION of Ralph Montague Esquire, complaining of an undue Return made by the Sheriff of the County of Northampton, of Sir Wm. Temple Baronet, to serve in this present Parliament for the Borough of Northampton, in Injury of the Petitioner, who was duly elected by the Majority of Voices who have the Right of Election, and had his Indenture returned and sealed by the Mayor of the Corporation, and ought to have been returned by the Sheriff, was read. Ordered, That the Matter of the Return for the Borough of Northampton be examined at the Bar of this House, on Monday Morning next: And that the High Sheriff and Under Sheriff for the County of Northampton, and the Mayor of the said Borough, do then attend: And that the Clerk of the Crown do then likewise attend with the Return. A Petition of John Dean Esquire, complaining of an undue Return of Charles West Esquire, to serve for the Borough of Andover in the County of Southampton, in Injury of the Petitioner, who was duly elected, and ought to have been returned, was read. Ordered, That the said Petition be referred to the Consideration of the Committee of Elections and Privileges; to examine the Matter; and report the same, with their Opinions therein, to the House. Ordered, That the Thanks of this House be returned to Doctor Tillotson, Dean of Canterbury, for his excellent Sermon Yesterday preached before this House at St. Margaret's Westminster: And that he be desired to print his Sermon: And Mr. Speaker is desired by the House, to give him the Thanks of the House; and to acquaint him with the Desire of the House, to print his Sermon. Ordered, That the Lwo Letters sent by St. Germaine to Mr. Coleman; the one directed under the Name of Lepine, the other under the Name of Catharine Burghill, which are undecyphered; be delivered to the Chairman of the Committee appointed to examine Mr. Coleman's Papers; to the end the same may be translated and decyphered by the said Committee. Ordered, That an humble Address be presented to his Majesty, to desire his Majesty, That Mr. Coleman's Letter to Mons. Le Cheze, of the Twenty-ninth of September 1765; and his following Letter, owning the Sending of the same; and Mons. Le Cheze's Letter, acknowledging the Receipt of Mr. Coleman's said Letter of the Twenty-ninth of September 1675; may be printed, and published: And that it be referred to Mr. Sachaverell, Sir Tho. Clerges, Colonel Birch, Sir Tho. Meeres, Sir Eliab Harvy, Sir John Ernle, Sir Tho. Higgins, Mr. Hamden, Mr. Powle, Sir Gilbert Gerrard, Sir Tho. Littleton, Sir Wm. Hickman, Sir John Coventry, Mr. Hall, Sir John Birkenhead; or any Three of them: And they are to meet at Two of the Clock this Afternoon, in the Speaker's Chamber, to prepare the Address. Ordered, That Sir Henry Capell, Mr. Hamden, Mr. Buscawen, and Mr. Gwyn, do forthwith repair to Mr. Coleman; and examine him, touching the Disposing of the Money which he received from the French Ambassador, or any other Money; and to ask him such other Questions upon the Debate of the House, as they shall think meet; and to take his Examination under his Hand. 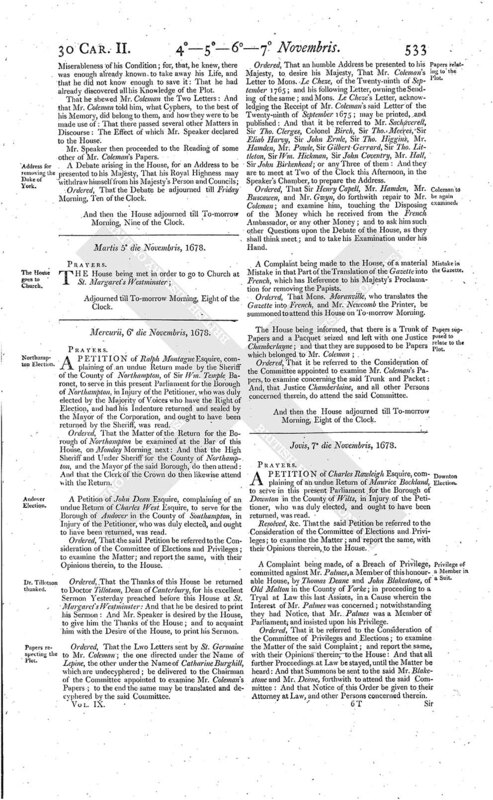 A Complaint being made to the House, of a material Mistake in that Part of the Translation of the Gazette into French, which has Reference to his Majesty's Proclamation for removing the Papists. Ordered, That Mons. Moranville, who translates the Gazette into French, and Mr. Newcomb the Printer, be summoned to attend this House on To-morrow Morning. Ordered, That it be referred to the Consideration of the Committee appointed to examine Mr. Coleman's Papers, to examine concerning the said Trunk and Packet: And, that Justice Chamberlaine, and all other Persons concerned therein, do attend the said Committee.